Nonlinear heat equation with nonlocal radiation boundary conditions. Navier-Stokes equations in the Boussinesq approximation. In the framework of the Matheon project C9 existence and uniqueness of solutions to the above system of PDEs is proved. Moreover, optimal control problems are studied. 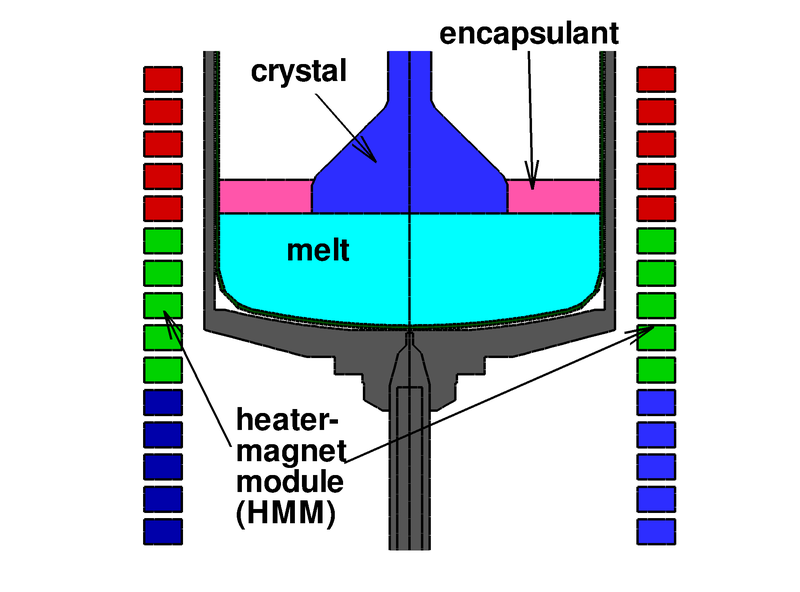 Within the interdisciplinary project Kristallzüchtung im Magnetfeld - KristMAG® (Crystal Growth in Magnetic Fields) the use of traveling magnetic fields generated by special heater-magnet modules (HMM) are investigated. 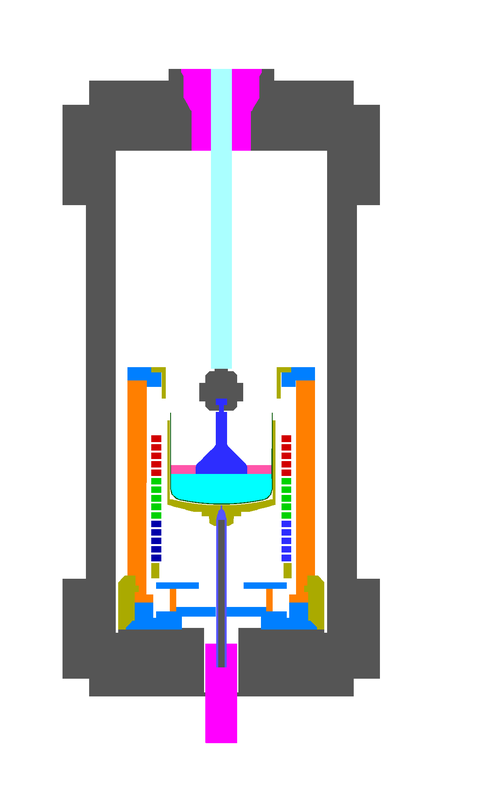 Those HMM consists of coils that are placed above each other (see figure below). They substitute inside the pressure chamber of the growth device the usual meander formed resistance heater units. Figure 2: Zoom into the liquid encapsulated Czochralski (LEC) crystal growth configuration with HMM. 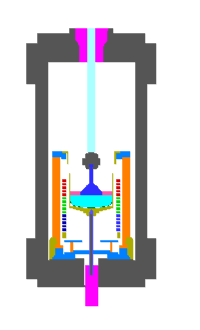 LEC crystal growth processes as well as processes according to the vapour-pressure-controlled Czochralski - VCz strategy are investigated. The simulations reveal the stabilizing effect on the melt due to the Lorentz force. This fact improves the quality of the grown semiconductor single crystals. Within the project Anlagen- und Verfahrensentwicklung sowie Absatz einer neuen Technologie zur Kristallisation von Solar-Silizium, AVANTSOLAR (Equipment and process development as well as sale of a new technology for the crystallization of solar silicon) it is studied how time dependent magnetic magnetic fields can be used to improve the yield during the production of multi-crystalline solar silicon. To this end the evolution of impurities within the melt is studied. 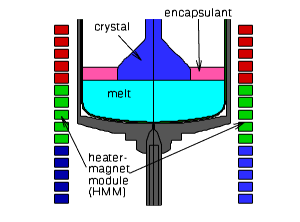 Moreover, effects near the triple line are considered where the interface between melt and crystal meets the crucible wall. Finally, global simulations of temperature and the magnetic field inside the overall growth apparatus are performed.